In many countries nurses are the largest single group of health care personnel. The health services need to be managed. The essential role of nurses in direct patient care and in the organization of supportive care, both in hospitals and communities, provides nurses with the potential for a unique expanded administrative role in health services. This book presents a broad view of nursing administration and education as seen by international nurse leaders and experts who are among the most distinguished authorities in their respective fields. 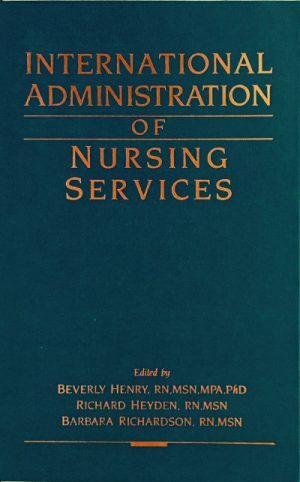 The content focuses on four main aspects of nursing administration: the practice, education, research and theory of management of health care services, and examines the most perplexing problems that nurses in management positions face in hospitals and in community settings throughout the world. These problems include: a shortage of nurses; an inadequacy of information and support systems; the lack of models of collaborative practice and education for nurses, physicians and health care administrators; the near absence of epidemiologic approaches in nursing; and limited participation by nurses in planning health services at local, national and international levels. The author analyzes these problems individually, pinpointing the salient points and giving her recommendations and guidelines for the future management of nursing services, education for nursing administration, research in nursing service administration and theory development. This important addition to the literature will be of great interest and importance to nurses involved in nursing administration or contemplating careers in this field. "Nursing experience from 20 countries is portrayed in this global undertaking that addresses health services management by nurses is without precedent. It shows that the dilemmas faced by nurses are not purely domestic and that they cannot be adequately solved by the citizens of any single nation, giving grounds for an internationals science of nursing administration."